Our couples are always searching for amazing vendors. In all categories, there are so many great options, however we are always on the lookout for reg flags. We want our couples to have the most flawless day. 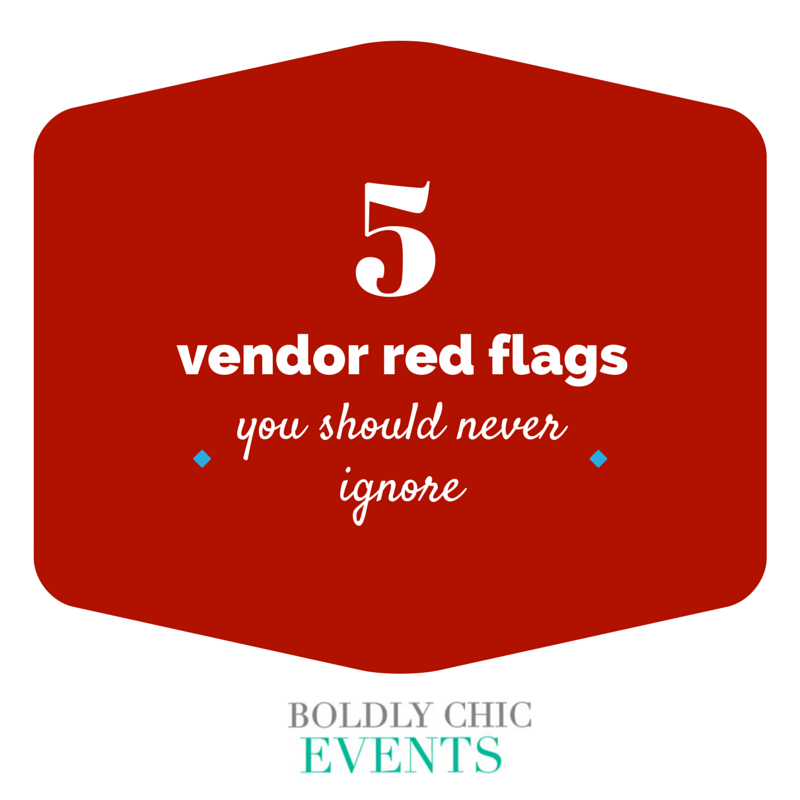 So, if any of these apply to a vendor that our client is considering, we will always speak up! This is a HUGE red flag for us. A verbal agreement is just not acceptable. This company and/or vendor may be great, or you know someone who has used them and everything turned out wonderfully - but without a written agreement, nothing is set in stone and they ultimately owe you nothing. This could result in a no show, a change in terms or pricing, etc., and you would have nothing to fall back on to insure you received the services you originally discussed. It is simply best to walk away if they are unable to offer a written agreement. Every vendor, without a doubt, should have references. This should be something they can easily send to you without hesitation. Reviews are extremely helpful as well, as you can see truthful, honest opinions from past clients. Both of these should be readily available to you as a potential client. Be sure the list includes real clients and not relatives, friends or employees of the company. Offering an overabundance of services always makes us uneasy. This may be "I'm a florist, planner and I offer stationery!" Vendors we see excel the most and offer the most amazing product or service, typically have one focus. Although something may seem like a great packaged deal; the end result may not be exactly as you had envisioned. Mainly because their focus is on 3, 4, 5 different tasks, rather than ONE amazing area of service. This is just not the day and age we are in. Every successful business should have a great website with an abundance of useful info listed. The Internet is one of the first places most of us to go to do preliminary research - which is why a website is crucial! Brides and Grooms are online more than ever and an online presence is not really an option. If the company has not invested in this easy-to-do marketing strategy, they may not invest in the "latest and greatest" for your event either. We encourage our couples to ask their contracted vendors for their honest opinions of other companies they are considering hiring. Again, a vendor that our clients are considering may be able to deliver a fantastic, final product or service - but do they work well with the vendors already in place? If this vendor is a total headache during the entire planning process and is even harder to get in touch with, but always creates something amazing in the end - is it worth it in the long run? Your big day will go off without a hitch when you have an experienced and trusted team of vendors by your side. Keep these in mind for your big day and as you go through the process of selecting your crew of professionals. These are the general guidelines we use when helping our couples and we think it keeps things realistic and in perspective. Go with your gut and you will be smiling the entire way through!